There are a lot of reasons why snakes are much better pets than most people may realize. Why is that? Unlike other pets like hamsters, mice, dogs, cats and birds, you only need to feed snakes once a week. So, they seldom need to defecate and urinate as often as other pets do, so their living space does not smell as bad as other kinds of pets. If you are one of those people who love exotic animals and find snakes interesting pets to have, here are the best practices in caring for pet snakes. 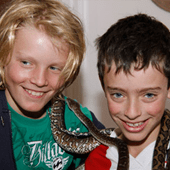 Housing – Snakes are a fairly calm type of animal and do not need a large area. However, what they do need is the ability to move vertically and horizontally. The best enclosure is a glass aquarium that can be secured shut with air holes. Snakes are great escape artists, so it is paramount to make sure that they stay safely inside their enclosure. It is highly recommended to provide a hide box inside the glass aquarium, a place where a snake can hide to feel secure. Bedding – Paper towels, newsprint, carpets and terrycloth towels are known as some of the best materials for snake bedding. Avoid using wood shavings, pea gravel and crushed corn cob since they harbour bacteria which might lead to health problems. Environment – Snakes need a warm and humid environment. They are cold-blooded creatures, so keeping a thermometer inside their house will help you maintain the right temperature. The ideal environmental temperature should be between 70 to 85 degrees Fahrenheit. Lighting – Direct, unfiltered sunlight is the best lighting for your pet snakes, because they are cold-blooded creatures. If this is not possible, the next best thing is an artificial UV light. The aquarium cage should only be lit for 10-12 hours a day to simulate daylight, and it should be dark the rest of the time. Having a light on a timer will help ensure that the lighting is regular. Feeding – As with any pet, clean fresh water must be available at all times. The water container must be large enough for the snake to submerge itself, because it is an important part of their behaviour to soak in water. When it comes to food, snakes can be fed with rodents, birds, frogs and salamanders. However, depending on the availability of these, most snake owners find rodents easy to acquire from their local pet store.